It’s funny how a meal can kind of form itself in my mind through a spectrum of memories, visual inspiration, and serendipity at the farmers market. 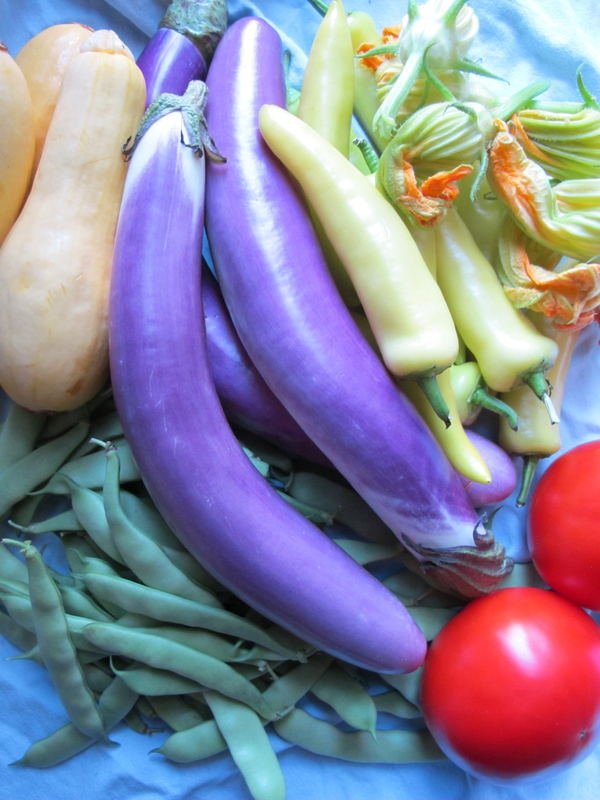 I brought home a bag full of produce from the farmers market and was so excited about the beauty of the pile of eggplants, squash, beans, peppers. I spread it out on the table at home like a vegetal color wheel. 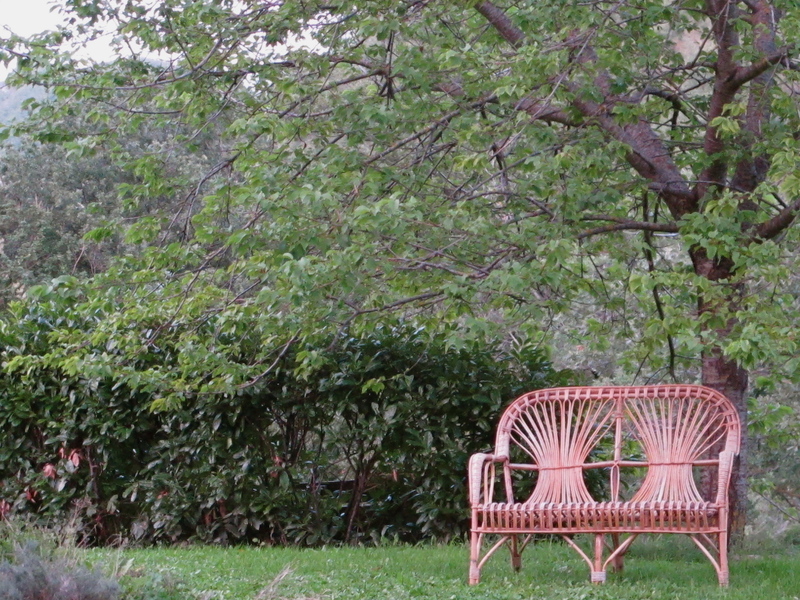 It was a pastel summer collection with the exception of the tomatoes, a watercolor wash of violet, gold, ivory and green. I loved the tonal spectrum of squash blossoms and wax peppers and decided to play with an old favorite by adding squash blossoms to a cheese filled pepper frittata. This is a gentle dish, subtly flavored, the mildest hint of heat from the ivory chartreuse peppers softened and mellowed by the creamy eggs and cheese. 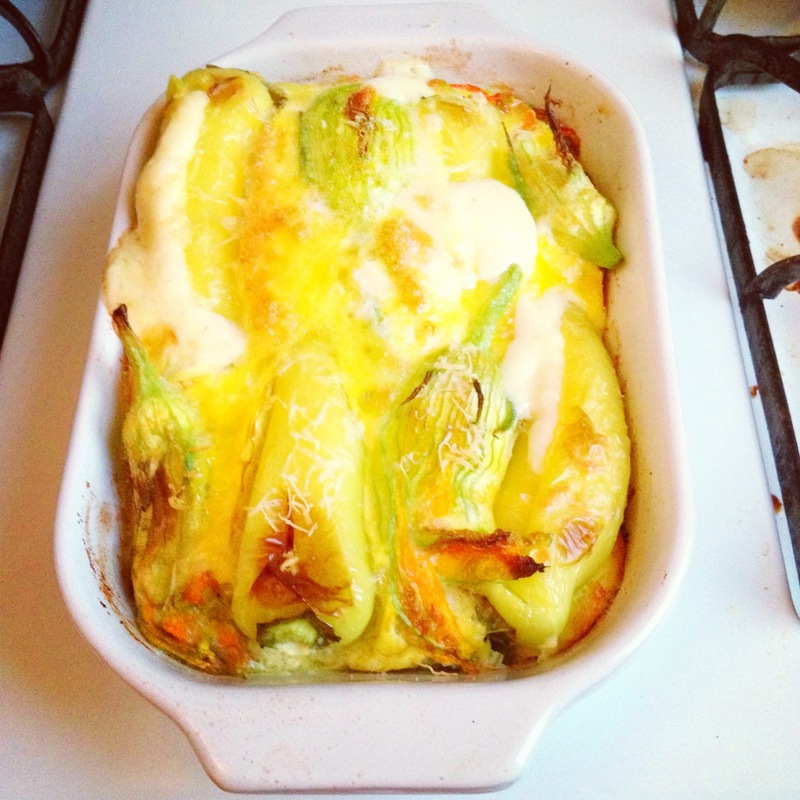 Squash blossoms infuse their delicate herbal flavor into the eggs as they bake. And if you prefer an even mellower flavor, go with banana wax peppers rather than its younger, slightly hotter cousin the Hungarian wax. The difference between Hungarian and banana wax peppers is maturity and heat level. 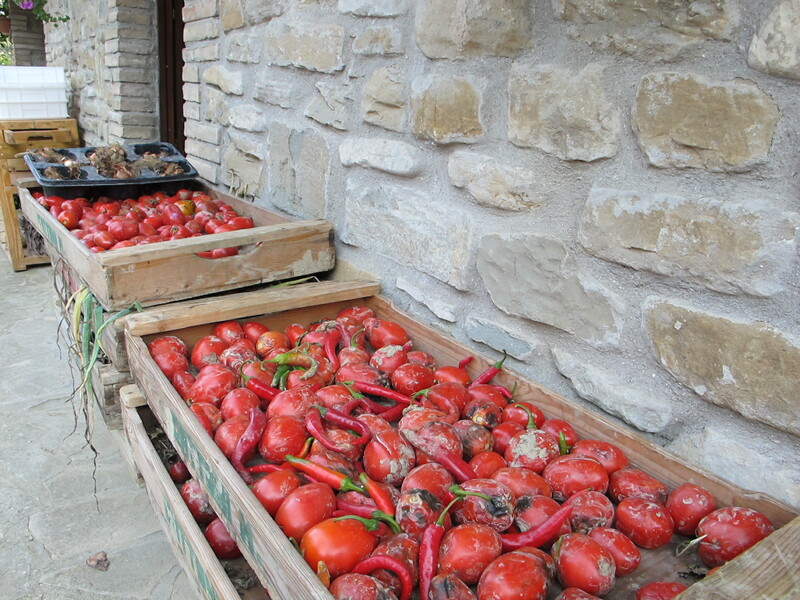 Hungarian wax peppers are younger, a little thicker fleshed, and mildly spicy. Banana wax peppers are a little larger, mild and sweet with thin flesh. This dish is easy-going in another way: do you like gooey strings of melted cheese oozing out with each bite or do you prefer the creamy tanginess of fresh goat cheese? Different cheeses produce different results, both lovely depending on your mood. For a buttery gooey melting cheese, I like a Fontina Fontal or Monterrey Jack. They melt beautifully but have a bit more flavor than Mozzarella. Goat cheese doesn’t melt but since it’s already soft and creamy, you may find its flavor makes up for that. An herb-flavored goat cheese is also a good way to add some extra flavor if you like. I’ve written this recipe to serve 2 but the proportions of 2 eggs, blossoms, and peppers per person are easy to double. You’ll just need to increase the cooking time by about 10 minutes per additional serving. Trim the stem ends of the blossoms to leave about an inch of stem. Gently open the blossom a bit and use your finger to pop the stamen off and remove it. The petals may tear a bit but that isn’t a problem since you’ll be twisting them closed around the cheese. Make a slit down the length of the peppers with a paring knife and rinse out the seeds. 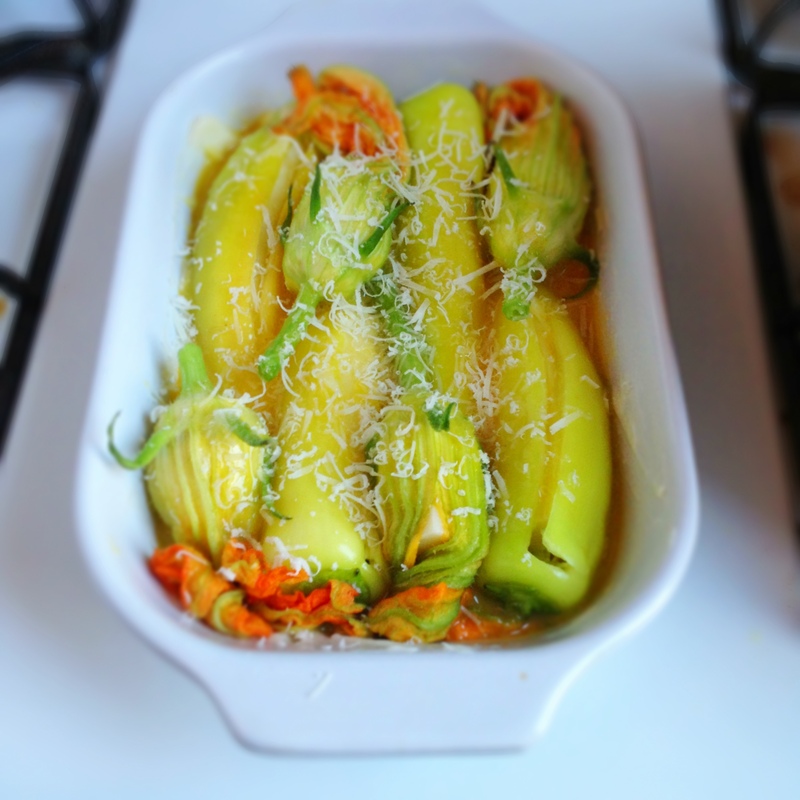 Cut the cheese into strips and chunks that will fit inside the squash blossoms and peppers, and slip the cheese inside. Twist the tips of the petals to close the cheese inside. If you are using soft goat cheese, spoon the cheese into the cavity in the blossoms and peppers. Beat the eggs and salt and pour them over the peppers and blossoms in the baking dish. Grate or sprinkle a little cheese over the top. Bake until the eggs have just puffed and set in the center of the dish, about—— and the cheese is lightly golden on top. Remove from the oven and allow to cool and set for 5 minutes or so before cutting. The weather has been a beast here this week. It has been as hot and humid as Satan’s armpit, the kind of weather where your window AC seems to churn the heavy air rather than actually cool it. 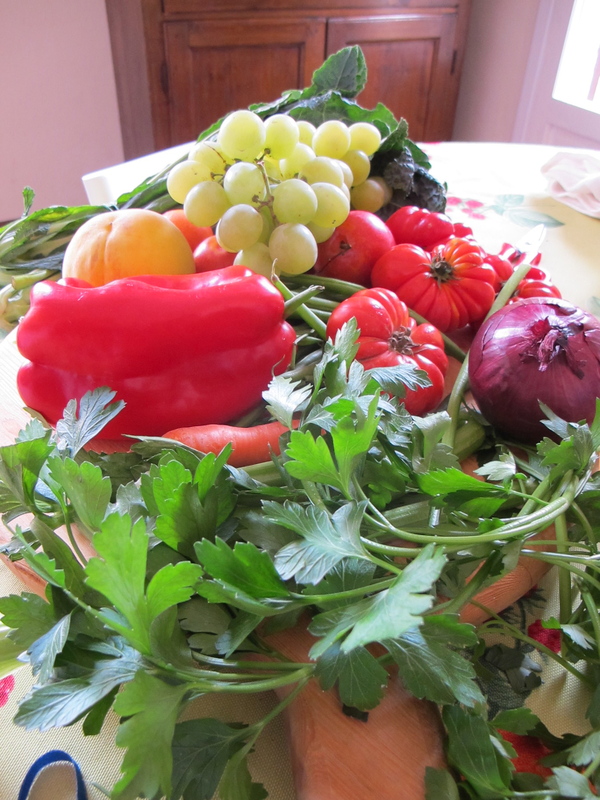 We’ve eaten a few of those cold olives and sliced tomatoes and bread and cheese suppers which I think are really lovely in the summer when tomatoes are sweet and juicy and raw or barely cooked vegetables are crisp and tender. Tacos of course required a little cooking, but not a lot. Salsa, slaw, and ice cream for dessert were fresh and light. While the weather was still hot this weekend, I had worked a long day and felt like something savory and substantial. 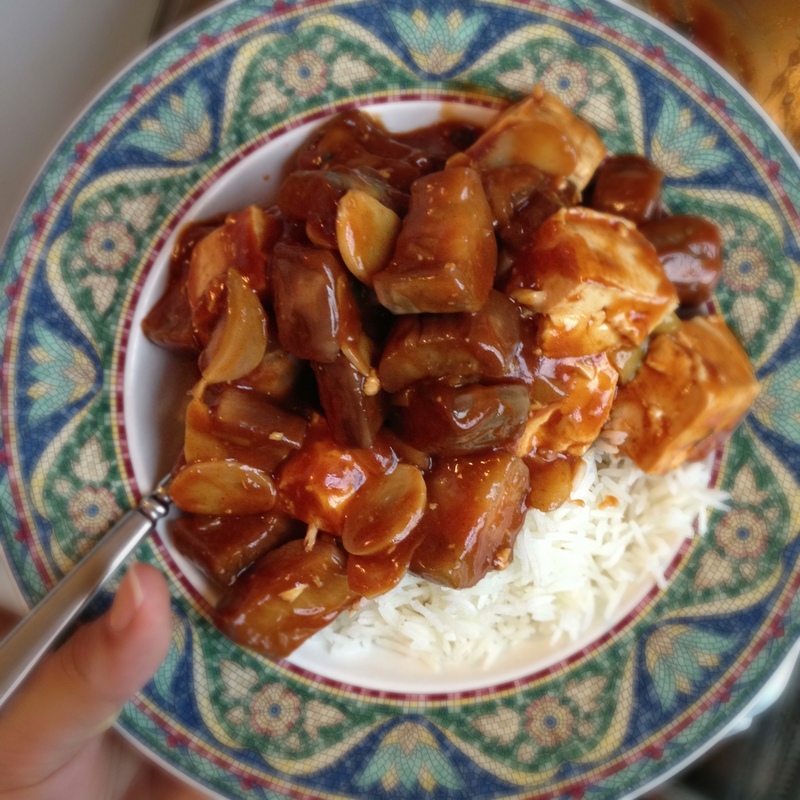 I had picked up a handful of slim violet Asian eggplants at the farmers market earlier in the week without a plan for how to use them and decided to quickly wok cook them with a spicy garlicky sauce. Eggplant can feel really savory and satisfying, soaking up whatever sauce they are cooked in.They are really one of my favorite things to eat. Combined with spicy sauce made with some Asain pantry staples, fresh soft tofu and fragrant Jasmine rice, the meal was cooked and I was away from the stove in about 20 minutes. Mix the fish sauce, soy sauce, gochujang, sugar, and water and whisk together until everything is smooth. Mix the cornstarch and water in another small bowl. Thinly slice the garlic cloves. 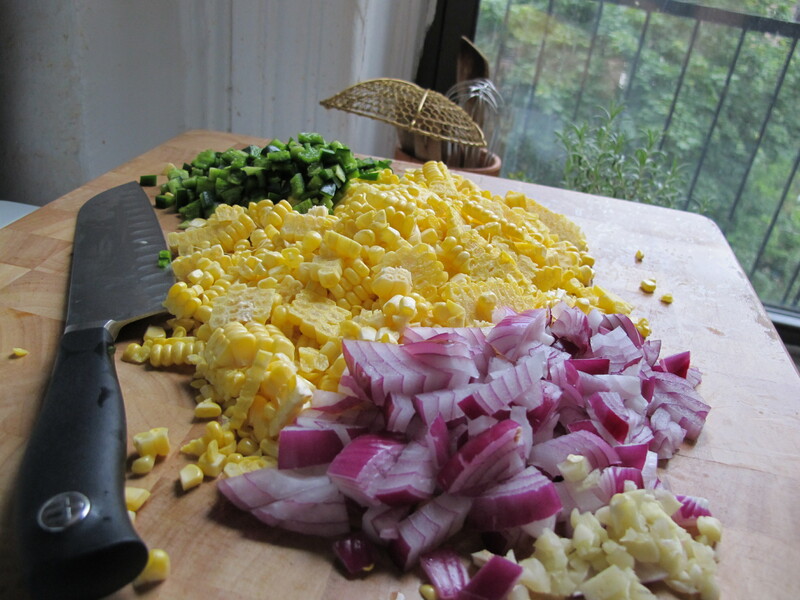 Chop the scallions into ½ inch pieces. Slice the peppers in half lengthwise, deseed, and slice them into thin slivers. Remove the stem end from the eggplant, slice them in half lengthwise, and them chop the halves into 1 inch pieces. Remove the tofu from the package, drain, and cut into 1 inch cubes. In a large wok or skillet, heat a couple of teaspoons of oil over medium heat until it shimmers. 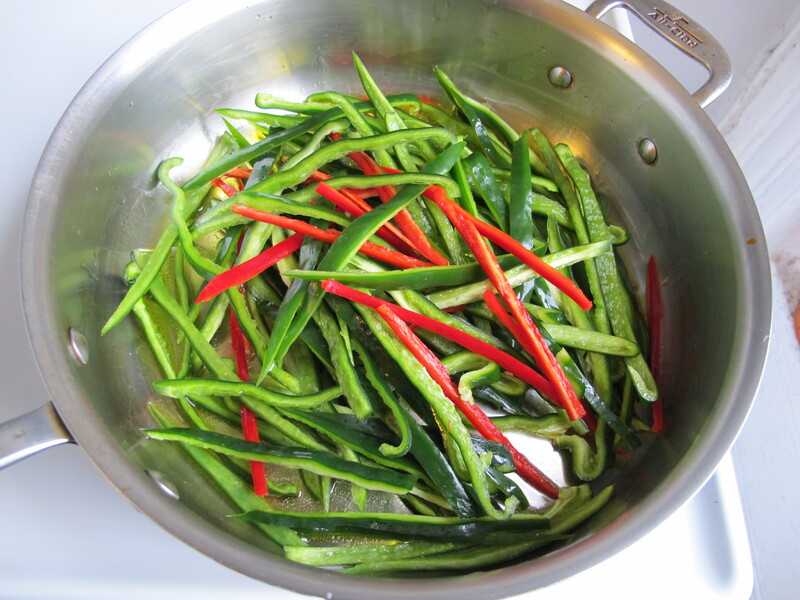 Add the garlic, scallions and peppers into the oil and stir constantly, cooking until they begin to soften. Add the eggplant and continue to stir. Cook the eggplant until the skin turns from purple to brown and the eggplant begins to soften, about 5-10 minutes. Take care not to burn the vegetables; if they begin to brown, lower the heat and add a small pinch of salt. The salt will help the eggplant release some of their water and help keep it from sticking. Gently stir the tofu cubes into the eggplant. Pour the sauce mixture in and stir. Cover and bring the sauce up to a simmer. Simmer for 2-3 minutes, just to infuse the eggplant and tofu with its flavor. Pour the cornstarch slurry over the sauce and stir. 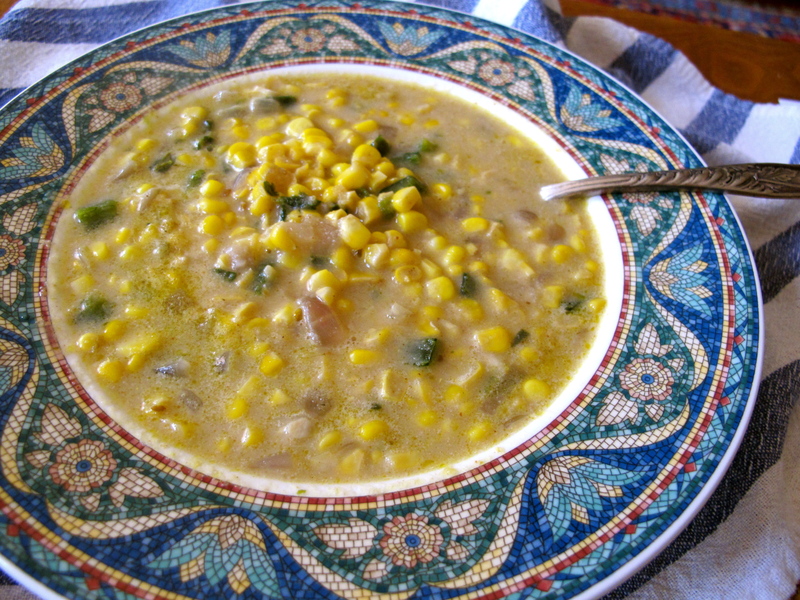 Bring it back to a simmer so that the cornstarch thickens the sauce. Drizzle with toasted sesame oil and stir. Serve over hot cooked long grain rice. *For and even spicier Sichuan-inspired version, substitute 1 tablespoon of Sichuan chili bean paste for 1 tablespoon of the gochujang and add a pinch of Sichuan peppercorns. Tomatillo salsa was just for starters for our last taco night. I made carnitas- style pork tacos with cumin slaw and these vegetarian cactus tacos with avocado cream and cotija cheese. Poblano rajas was the base for the taco filling- strips of seasoned poblanos cooked with charred sliced onions and spices. 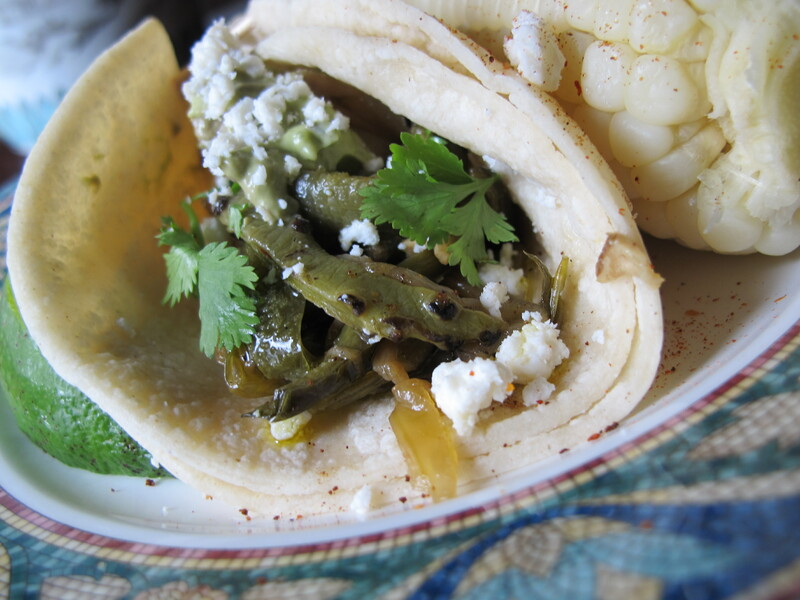 Poblano rajas are great as a side with meat, burgers, scrambled eggs, mixed with cream or cheese. Adding the nopal cactus strips made them a substantial and succulent taco with the creamy avocado and salty cheese. Nopal (prickly pear cactus paddles) are similar to both aloe leaves and okra. They hold moisture in their fleshy paddles with the soluble fiber called mucilage. 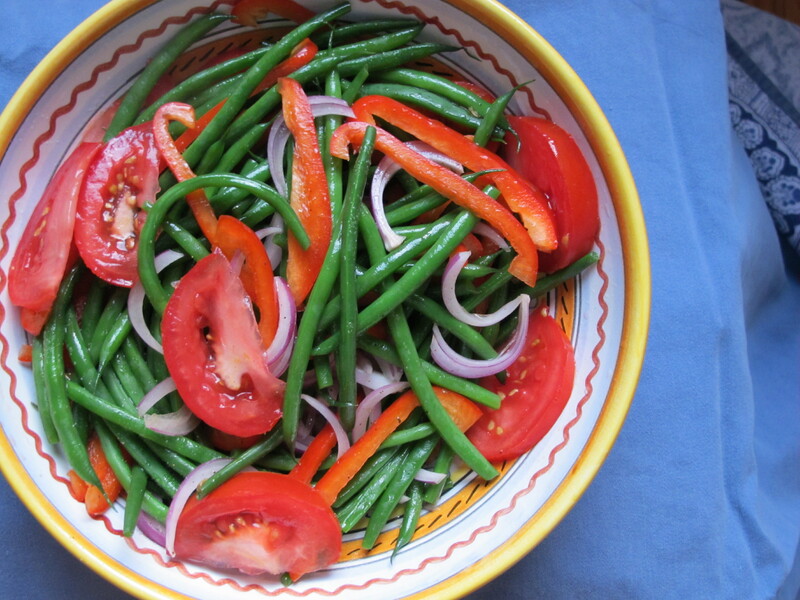 Cooked, they are a bit like a green bean and a bit like pickled okra, the tender crunch of the green bean and the silky tangy texture of pickled okra. They add a bit of body to soups, a bright crunch to huevos rancheros, and pickled, would probably be great in a Bloody Mary! I’ve seen cactus in several forms in markets: canned in jars, de-clawed and diced in plastic bags, or whole with the larger spines removed but still a bit prickly. I usually try to buy them whole. Most vegetables start to deteriorate once they are cut at all and it can be hard to see their condition when they are wrapped in plastic. If you are shopping in a place with a lot of turnover in the produce department and a clientele that will buy enough pre-cut cactus to make you confident in its freshness, buy them. It will save you a step or two (and possibly a prick in the fingertip). But don’t be intimidated by the whole paddles. It’s a pretty simple matter to de-claw them at home; either stick a fork into the fleshier end and scrape them with a sharp paring knife or singe them over a gas flame until the spines are burned off. Once the spines are blackened, a quick rinse will wash away anything that is left. 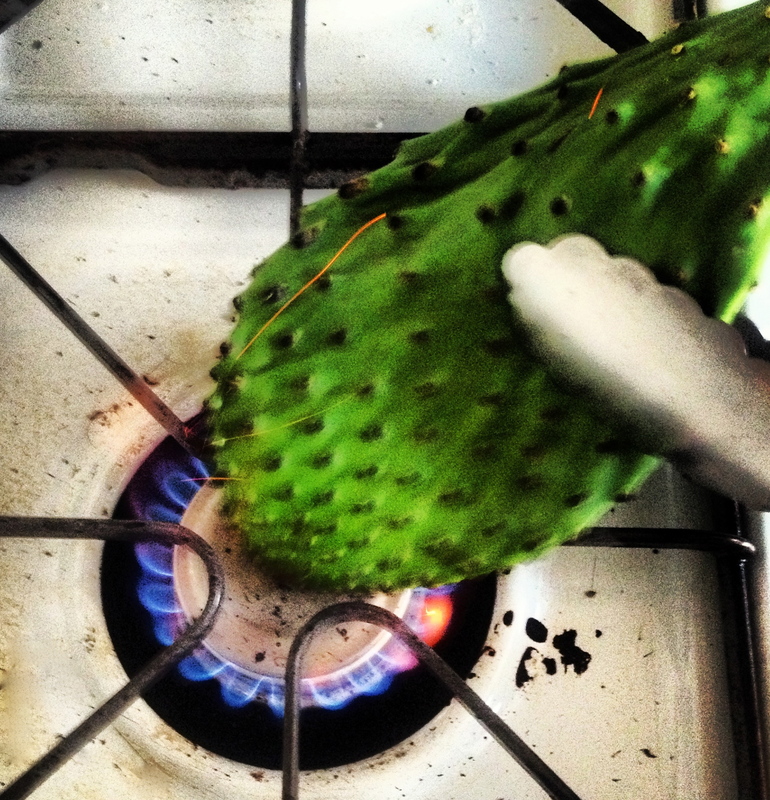 Start by preparing the nopal. Using tongs, hold the paddle by the thicker end over a gas flame until any spines are singed. Rinse briefly to remove any charred bits of spine. Slice them on the bias into 1/4 inch strips. Remove the stem ends and seeds from the chiles. Slice them lengthwise into thin strips. Remove the stem and root end from the onion and cut into thin strips. Smash the garlic and mince into a paste. Heat a large skillet over medium high heat. Add the slices of onion to the dry skillet and cook, stirring often until the onions begin to char just a bit. Scrape the onions out onto a plate and set aside. Lower the heat under the skillet to medium low and add a tablespoon or so of olive oil. Add the chile strips, salt, garlic, and spices and cook for about 10 minutes or until the chiles are beginning to soften. Add the onions and the cactus strips, stirring to mix. Cook, stirring occasionally and watching that the vegetables don’t stick to the pan until the onions and peppers have collapsed into a silky sticky savory tangle and the cactus has lost its vibrant green color and becomes a soft olive green. Taste for texture- the cactus should still have a bit of a pop between the teeth but be very tender- and salt to taste. Serve in a taco with corn tortillas, avocado and cotija. Or use as a filling for omelette, on top of a burger, with a smoky roast chicken. We had a friend over for tacos last night. I know he has excellent taste in tacos (despite an admitted penchant for Dorito Tacos Bell Grande)in part because one of the first times we ever “ran into” someone out in NYC, we ran into him at our favorite Manhattan taqueria, the eponymous Taqueria LES, which makes great barbacoa and lengua tacos and chile salsa. Consequently, I wanted to bust out a few of my favorite taco night accoutrements for an especially appreciative audience. 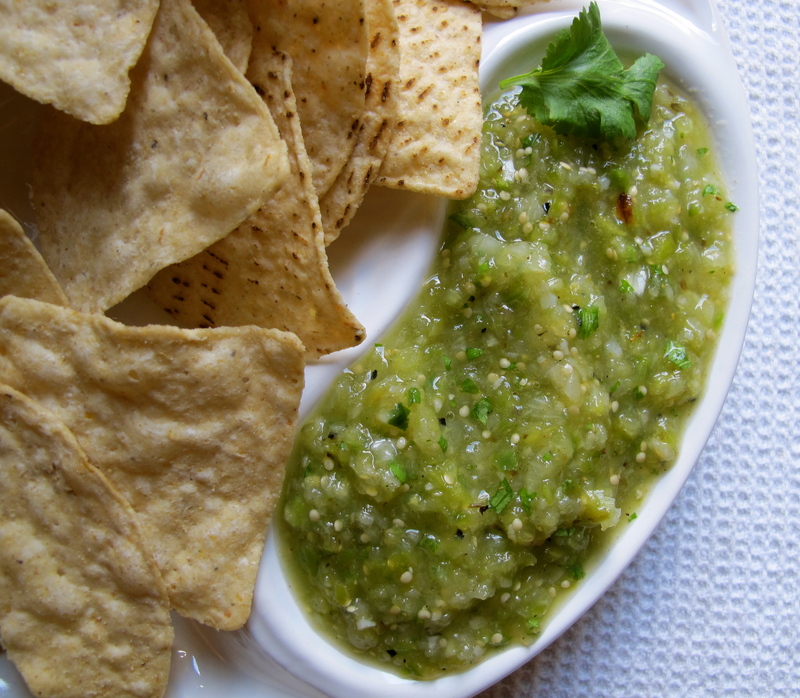 We had this tomatillo salsa to eat while we were drinking margaritas and finishing up cooking the carnitas-style pork tacos with a red cabbage cumin slaw and pineapple salsa and a nopal poblano rajas taco with avocado cream and cotija. The interesting thing about this recipe is that it functions as two-in-one in a way, depending on how long the ingredients are cooked. The version in the photos is on the less-cooked end of the spectrum, giving a lighter, tangier result. 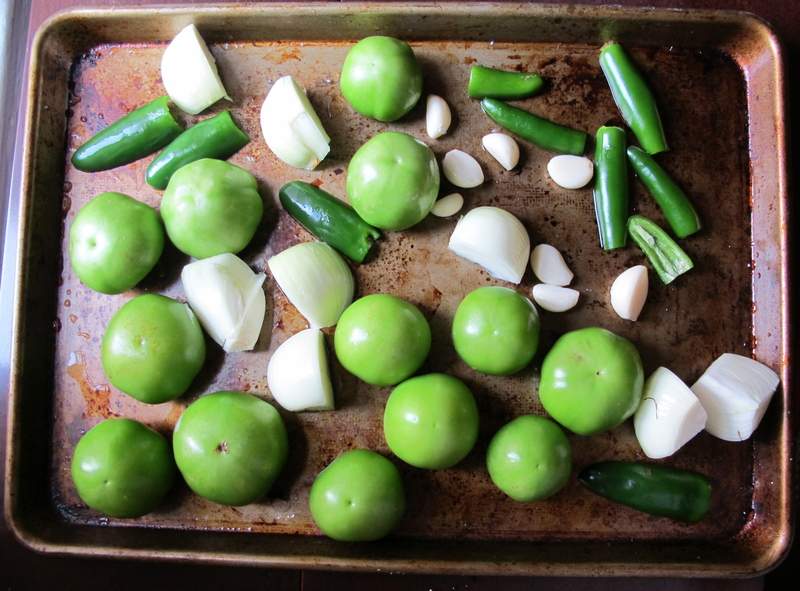 Cook the tomatillos and onions longer and it concentrates their natural sugars and flavor, darkening the color and making a richer, sweeter salsa. I’ve used the more cooked version as a base for pork chile verde as well as a salsa for chips. It’s sweet, tangy, and delicious. But this lightly charred version is the bright flavor I craved during the stultifying heat we are living in this week. It’s also pretty much as long as I could stand having the oven on in the kitchen. The grill is also a great way to achieve the smoky char that deepens the flavor of this salsa so intriguingly. Throw the peppers and onions straight onto the grate, but the tomatillos will burst, so keep them on a pan of some kind so all of the tomatillo juice isn’t lost. If you decide to go with the more cooked version, you will want a bit more lime juice to balance the sweetness of the tomatillos and onions. And of course, the number and heat level of the chiles you use is dependent on your heat tolerance. This version has a medium heat level- add or subtract accordingly. 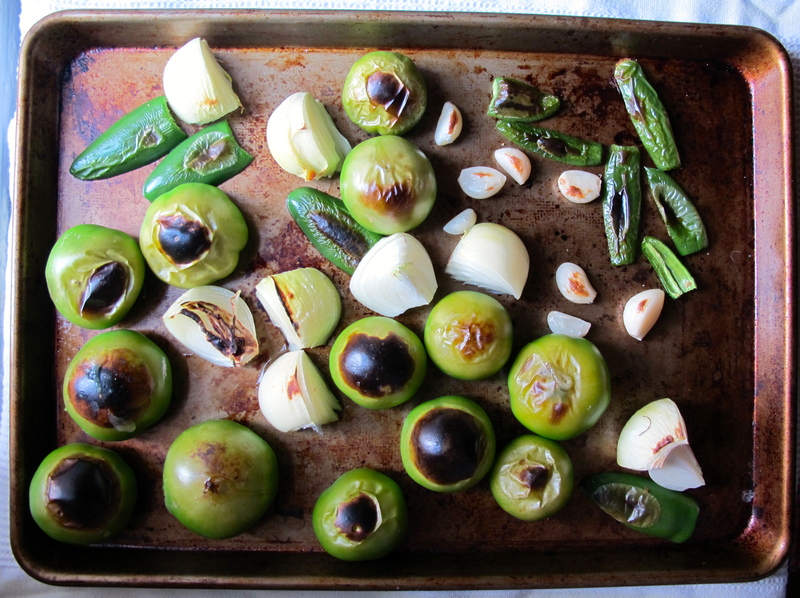 Remove the husk from the tomatillos, rinse and dry. Slice the chiles in half stem to tip and cut the onion into wedges. Peel the garlic cloves. Arrange everything on a baking sheet in an uncrowded layer. Do this step in 2 batches if space is an issue, rather than crowding the pan. Heat your broiler up and place the tray of vegetables under the heat source. Keep and eye on them, turning the vegetables or shaking the pan occasionally if they are browning too unevenly. Once everything is beginning to soften just a little and some of the surface has a little bit of a char on it, remove from the oven and set aside to cool for a little bit. Cut the larger stems off the cilantro and roughly chop the leaves. Scoop the tomatillos, chiles, onions and garlic into the bowl of a food processor and pulse a few times to break the chunks down and allow the mixture to move and mix. Add about half the lime juice and the cilantro leaves and spices and pulse a couple of times. Once you have reached your preferred consistency ( I like it on the chunky side) pour the salsa into your container and taste for salt and tanginess. If it needs more tartness, stir in more lime juice. Otherwise you’re halfway to a margarita. The flavors really improve after sitting for at least 30 minutes so I would recommend waiting until then to make any major adjustments to the seasoning. If you prefer more heat at that point, stir in a pinch or two of ground cayenne or chipotle. No one is going to be surprised to hear that our trip to Italy last September was inspirational to my cooking. After living in the city for a couple of years, we opted to go country to start our vacation way off the beaten path. 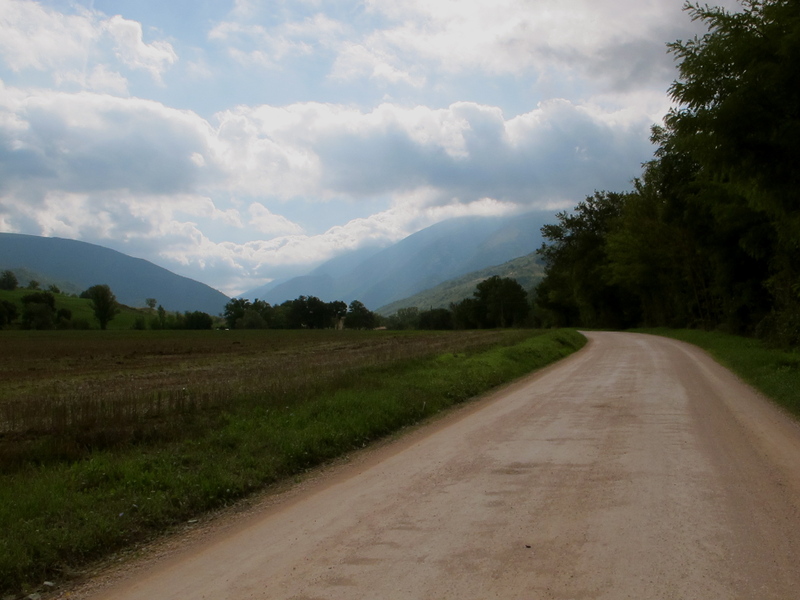 We drove from Rome’s Fiumicino Airport up through Umbria on the back roads and across the spine of the Appenines into Le Marche, to Piobbico specifically, down a dusty road through the hills to La Tavola Marche, an agritourismo owned by hosts extraordinaire Ashley and Jason Bartner. 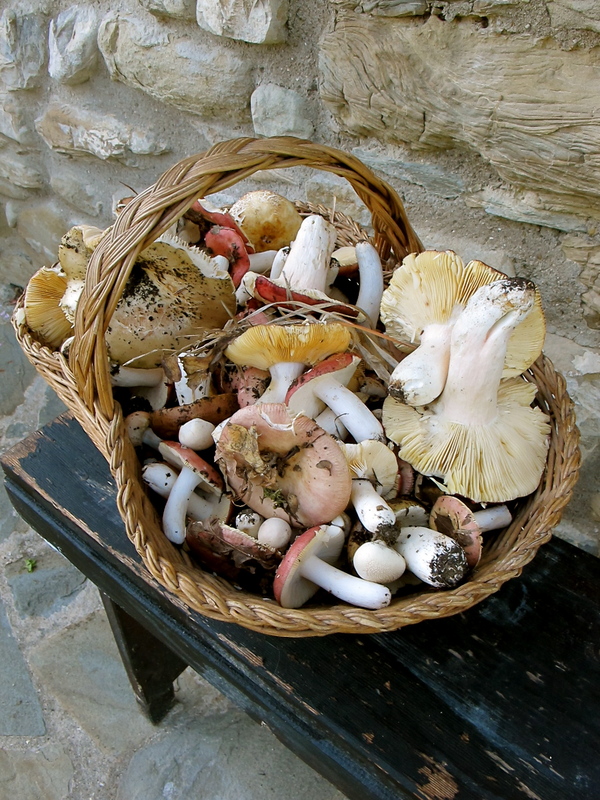 Driving in, we passed a few cars parked in the grass on the sides of the road, saw a man disappearing into the trees with a stick and a basket: mushroom hunters! With the cooler weather and fall rain, the mushrooms were starting to pop up on the hillsides. Ashley and a friend of the farm, a local cardiologist and mycologist took a few guests on a mushroom hunt one afternoon. We were lucky to find a couple basketfuls of mushrooms during our scramble through the trees and underbrush. Our visit being during the shoulder season (not dissimilar to the cool wet Spring we’re having here this year), dinners were a mix of the last of the garden produce and heartier cool weather fare. Everything Jason cooked was incredibly delicious, simple but beautiful ingredients prepared in interesting ways, unpretentious but as good as any white tablecloth meal I’ve ever tasted. We ended up eating every dinner there, unable to resist the nightly feasts. 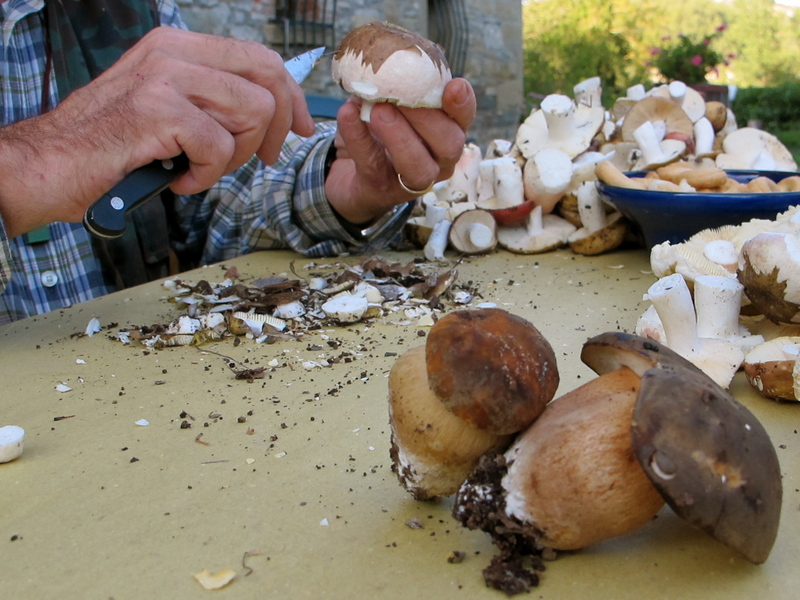 I love the intimacy with which Italians (born and adopted) dealt with their food: the mushroom hunts, the seat in the sun with a glass of beer to clean each mushroom by hand, the well-attended weekly markets in each town, the cheerful and lengthy discussions about gelato flavors, the long family lunches we saw on the Adriatic in Fano, the resourcefulness of “eating up the garden” before the weather turned. It’s a characteristic of that culture that places a high value on the fellowship of the table as well as the food that is placed on it, a congenial community feel to the act of eating. This was a salad we were served as part of a prima course, but so immensely satisfying that I’ve adapted it to be a really delicious main course salad. 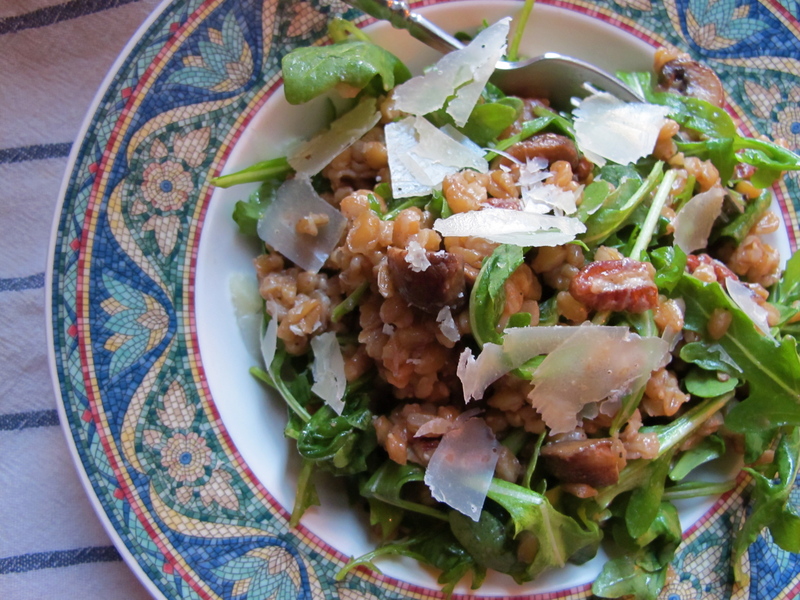 A couple of the ingredients, farro and porcini, might be a little exotic, but are two of my favorite pantry staples. Farro is the grain that fueled the Roman’s armies, an ancient grain that is similar to spelt. 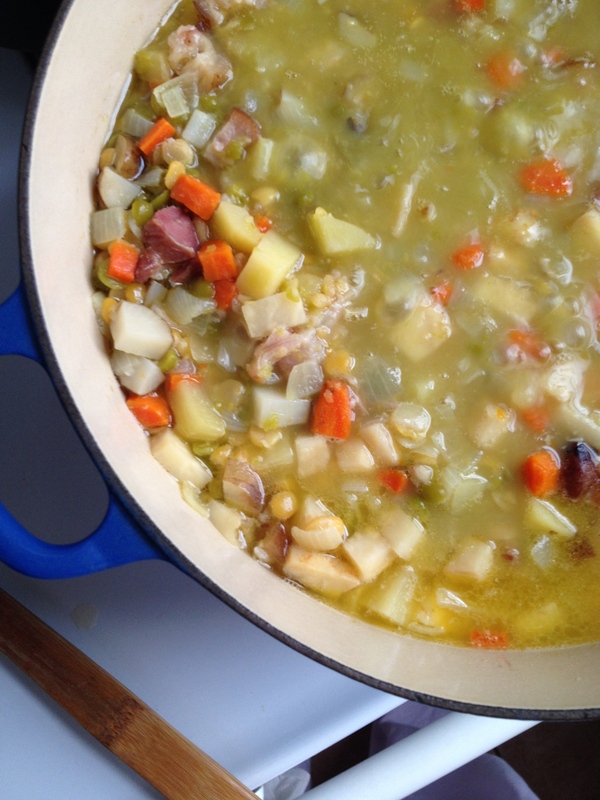 It is chewy but not sticky with a hearty flavor ( a bit like wild rice). 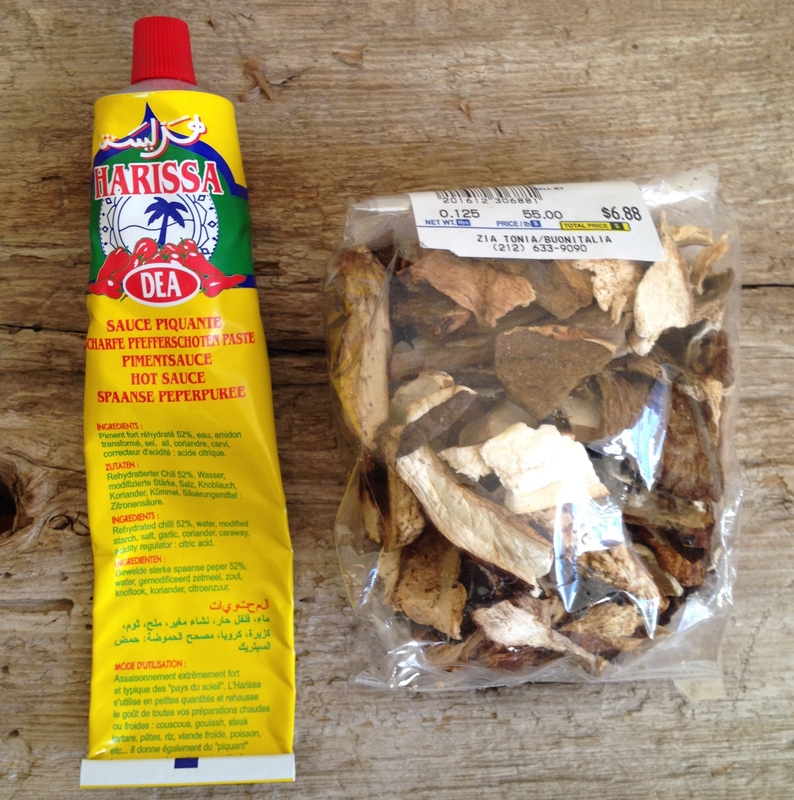 Porcini – I very occasionally see fresh porcini for sale, but they are usually pretty expensive and a bit battered and bruised so I use dried porcini instead. Porcini (which means “little pigs”, isn’t that awesome!) have a rich earthy meaty flavor that I love. 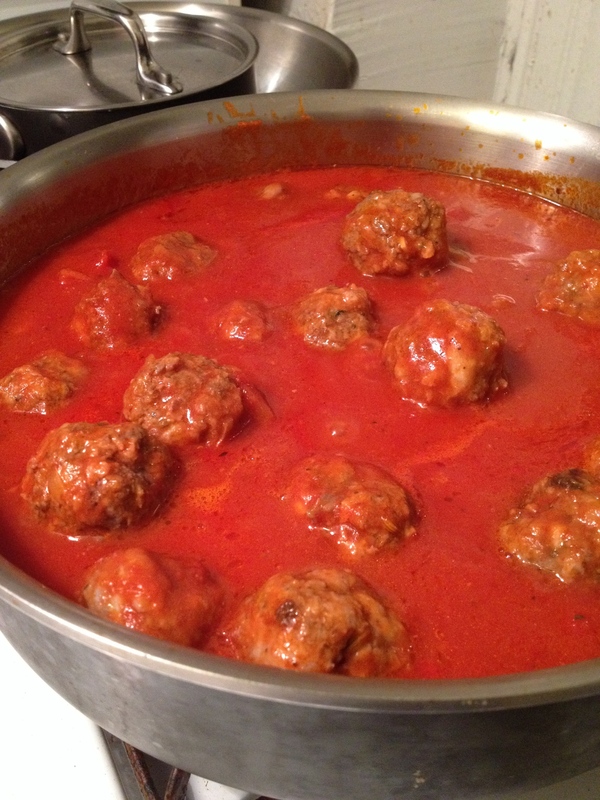 I use them crumbled in my meatballs and meat sauces and to flavor risottos. 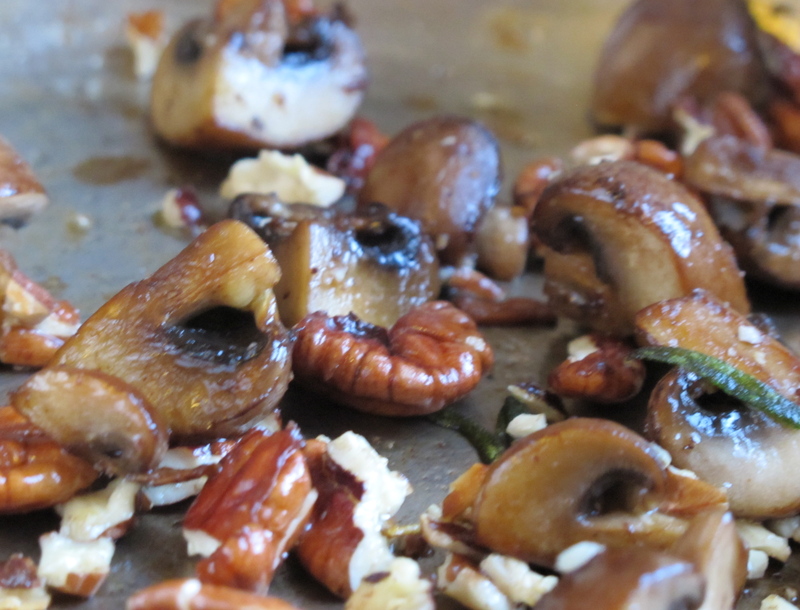 I’ve also added fresh crimini mushrooms to this recipe for substance, flavor and texture in lieu of foraged mushrooms. The nuts and arugula add crunch and a peppery bite and the salty tangy pecorino cheese rounds out the flavor chord. 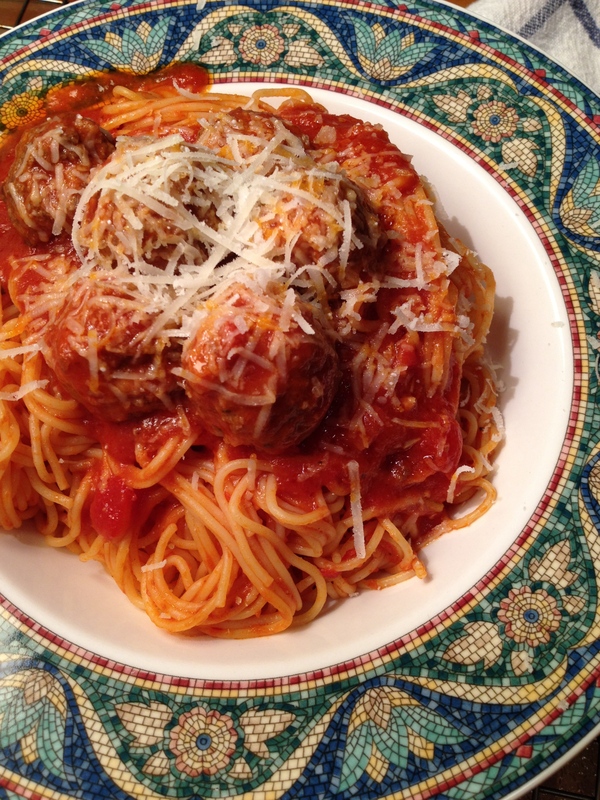 I’ve adapted this recipe from my memory of the meal we had in Italy and have posted it with the Bartner’s permission. 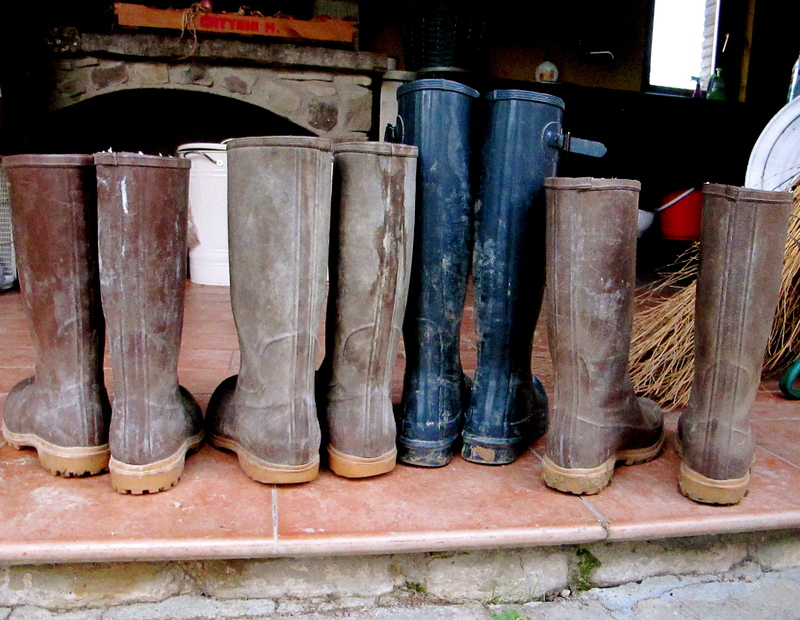 Rinse the farro under running water to remove any dust or husks. Add the dried porcini, cover the grain with the water and let it soak for a couple of hours or overnight in the fridge. Add salt as if you were salting pasta water. Cook the grain in the soaking water for 20-25 minutes until the farro is chewy but not mushy. Drain thoroughly in a sieve to remove any remaining cooking liquid. Heat a generous glug of olive oil in a large skillet or sauté pan over high heat. 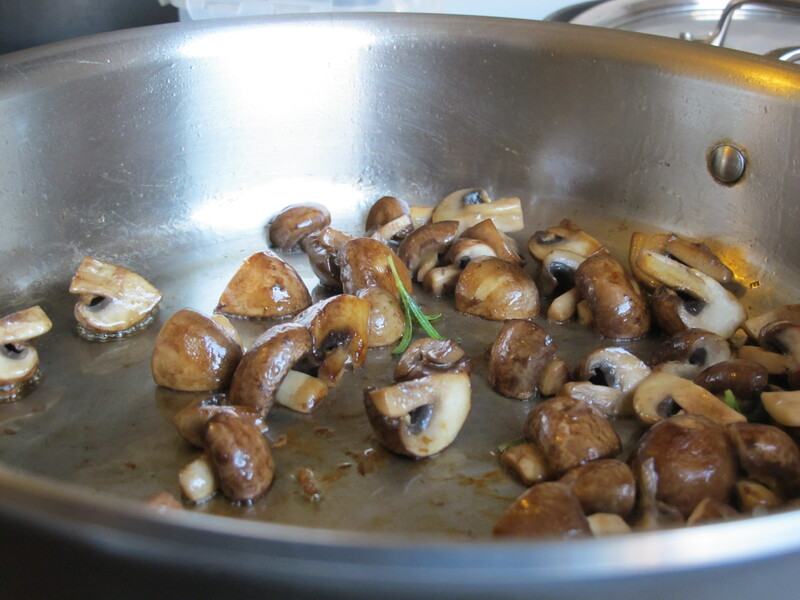 Add the mushrooms and cook, stirring occasionally until they become bronzed and golden. Add a pinch of salt and the rosemary, lower the heat and stir in the chopped nuts, Stir together over medium heat until the nuts are lightly toasted. Remove the pan from the heat and add the farro. Toss in the arugula and another drizzle of olive oil, allowing the arugula to wilt a bit in the residual heat. Serve at room temperature with pecorino romano shaved over the top. Well, I’ve pretty much laid bare my okra loving soul to y’all over the past three posts. It’s not an exhaustive treatment of the topic, but I’m hoping it’s enough to get some of you over the fence and back into the fold. It wouldn’t really be an okra series without talking about probably the most popular way to cook okra: I’m talking fried, baby! It’s the first thing most people think of when you say “okra”But never fear, I am not without sturdy opinions on the topic. Let’s talk technique. First, I think I’ve mentioned before that I am neither a frequent nor enthusiastic deep fryer.I’ve never had a kitchen with a ventilation system that could stand up to it and that day old fried smell is enough to stop me. I like to pan fry okra about waist deep in hot oil. It’s quick and effective and it suits my dredge approach to the okra’s crust without the mess or commitment of deep frying. On to the next point: dredging versus breading. As you may know, if I want a deep fried corn bread nugget, I’ll go with a hush puppy every time. The breaded version of fried okra is just a substandard tiny hush puppy with a piece of soggy okra inside, which is neither want I look for in a hush puppy or in fried okra. 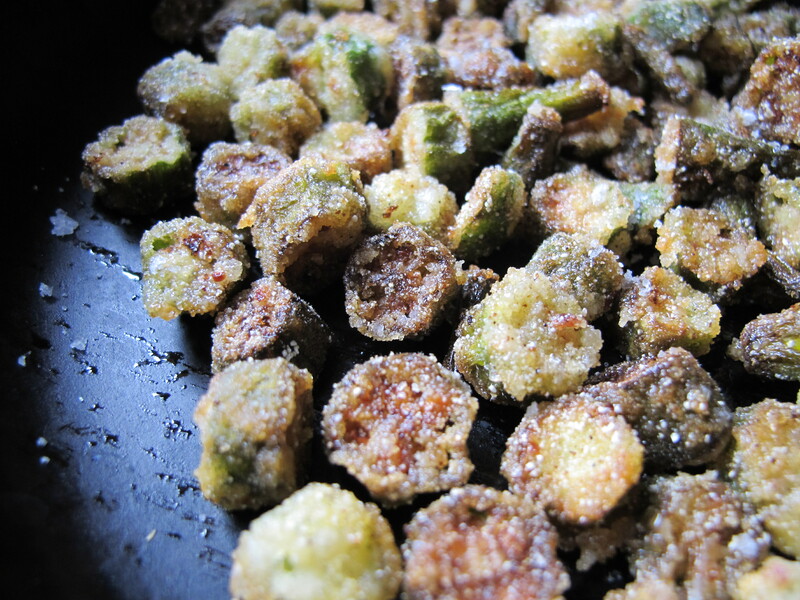 The beauty of fried okra is the okra. Covered in a thin crunchy carapace, it’s the okra that you taste, not the pouf of breading, and the moisture released from the cooking okra has more of a chance to escape. I think the texture of the cooked okra is superior to the swaddled steamed version that happens when you have breading. I just like it better. I think it’s a better bite. This is why I dredge my okra. Having established my position on pan versus deep fry and dredge versus bread, let’s move on to the ingredient portion of the dredge. I’ve gone through several versions of the dredge over the years and have found my favorite. I started with a mixture of regular corn meal, all purpose wheat flour and seasonings, but found the contrast in texture between the corn meal and flour too extreme. The okra stayed gritty or fell off and burned leaving me with a thin veil of flour dredge. 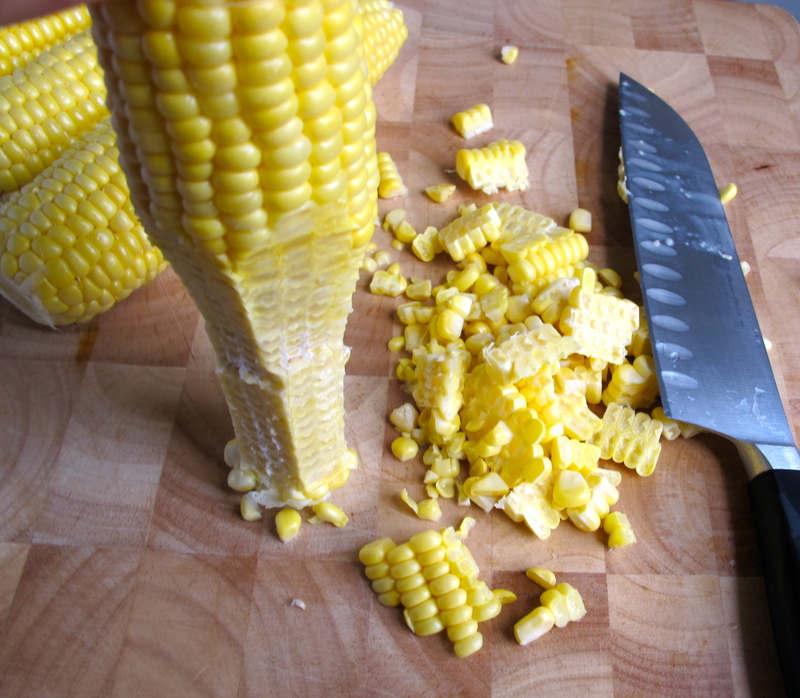 I discovered corn flour, a finer grind of corn meal that I use a lot not only in cornbread but in pan fried recipes because it adheres evenly and cooks quickly without leaving behind the sensation of a mouthful of sand. I mixed it with wheat flour as I had with cornmeal, which was fine, but when I tried the corn flour by itself once, I found that I preferred just the corn flour. It coated the okra evenly, had a good flavor, and gave it a nice crunchy (but not gritty) texture. 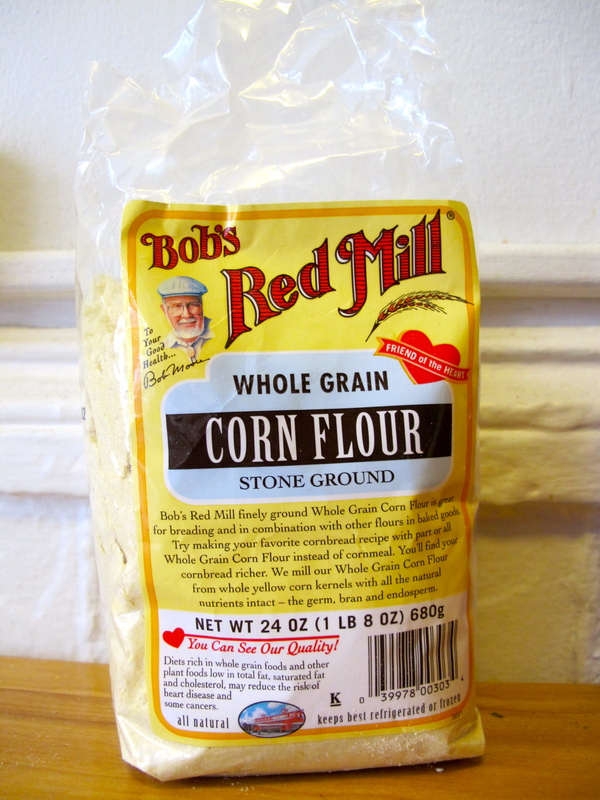 It seems to fulfill the roles of both cornmeal and wheat flour without the drawbacks of either. As far as recipes go, this is necessarily an “eyeball it” recipe. The measurements really depend on the amount of okra you have, the moisture in it, and your preference in seasoning. It’s more of a guideline than a recipe, but that’s all you really need. Rinse the okra and remove the stem ends. 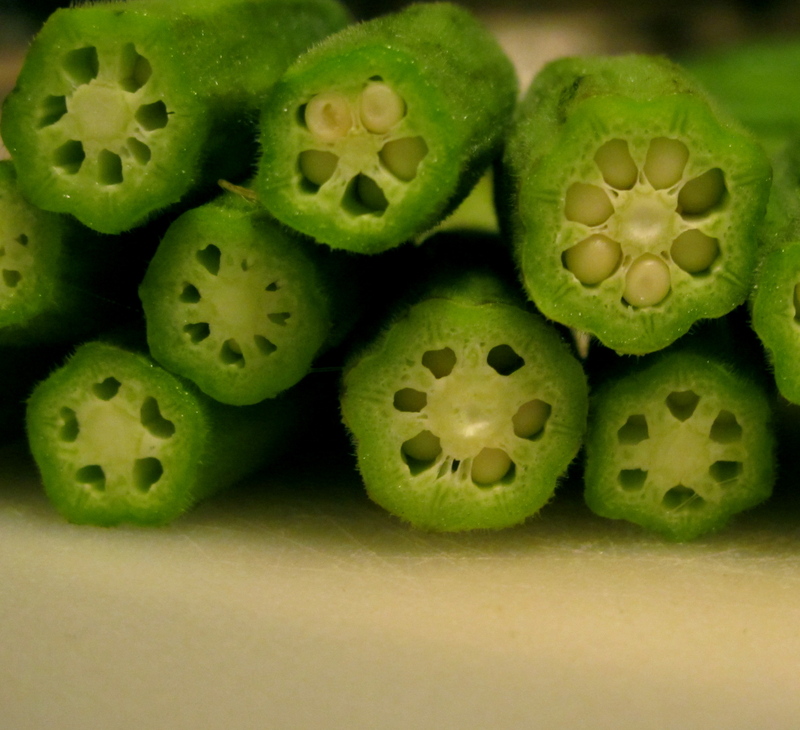 Slice the okra into about ¼ inch rounds. I usually cut them a bit thicker toward the pointed ends so that everything cooks in more or less the same amount of time. Don’t dry the okra off; in fact, if it gets dry, I usually sprinkle a little water or buttermilk over the slices to make it damp enough for the dredge to stick. In a large frying pan, heat the oil over medium high heat until it shimmers. Try a test piece; the okra should immediately sizzle. Some of the corn flour is going to fall off into the oil but if the oil is hot enough, most of the dredge should stick and start to cook immediately. Working in batches if you need to, add just enough okra to make one layer in the pan with a little elbowroom. Allow it to sit in the sizzling oil for 2-3 minutes without moving it; then after checking the bottom side to see if it is brown enough, use a wide spatula and turn the okra over so that the other side can brown. Other than shaking the pan occasionally to even the layer, don’t mess with it. It needs to stay in contact with the hot oil to crisp and brown. Once the okra has gotten as dark as you like, scoop it out of the pan with a slotted spoon or spatula onto absorbent paper to drain off any leftover oil. Sprinkle with some flaky salt and eat it while it’s hot (or cold- it’s awesome both ways).